President Donald Trump rebuked supporters of late term abortion and urged Congress to ban the practice in his State of the Union speech Tuesday night as conservatives and pro-life activists cheered the move. “There could be no greater contrast to the beautiful image of a mother holding her infant child than the chilling displays our nation saw in recent days. Lawmakers in New York cheered with delight upon the passage of legislation that would allow a baby to be ripped from the mother's womb moments before birth,” the president said to much applause. 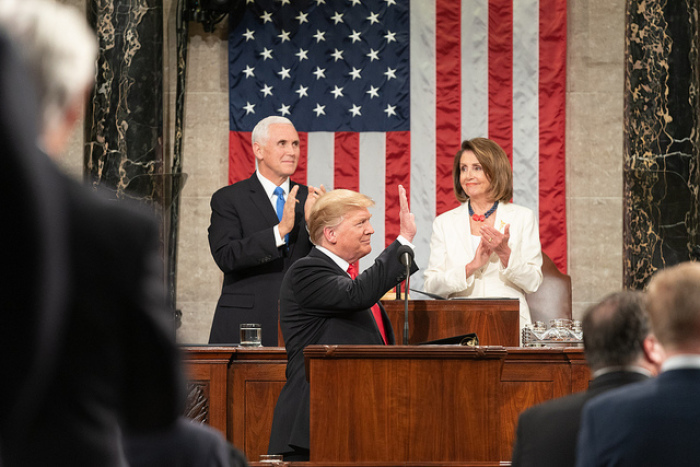 The president’s remarks came as Dr. Leana Wen, president of abortion giant Planned Parenthood, sat in the audience as a guest of House Speaker Nancy Pelosi. “The lies that we heard tonight are nothing new. The only thing new is that it is the President pushing these falsehoods,” Cuomo tweeted. Pro-life organizations such as March for Life, which seeks to end abortion by uniting, educating, and mobilizing pro-life people in the public square, applauded the president for condemning extreme abortion. “We applaud the President for condemning the extremist abortion propositions out of New York and Virginia and for calling on Congress to ban late-term abortion during his State of the Union Address. The American consensus opposes abortion after the first trimester, yet some politicians continue to embrace and perpetuate an unprecedentedly radical pro-abortion agenda,” said March for Life Action President Tom McClusky. He then named Northam and Pelosi for her support of Planned Parenthood and said they were out of touch with America’s current view of abortion. “While politicians like these are in step with a powerful abortion lobby, they are out of touch with the American people. We ask Congress to heed President Trump’s call to pass legislation prohibiting late-term abortion as well for a quick floor vote in the Senate on the Born-Alive bill so that Governor Northam’s infanticide fantasy may never be reality. It is time for politicians, regardless of party, to stand up in favor of protecting innocent life,” he added. On Monday, a bill meant to preserve the life of babies who survive an abortion attempt was rejected by Senate Democrats after Nebraska Republican Sen. Ben Sasse pleaded with them to unanimously pass the measure. “This isn’t about Republicans or Democrats. We're way beyond that. Everyone in the Senate ought to be able to say unequivocally that the little baby deserves life. That she has rights, and that killing her is wrong,” Sasse declared in remarks seeking unanimous consent on the rejected Born-Alive Abortion Survivors Protection Act.